In 12-inch nonstick skillet, cook ground beef and gingerroot over medium-high heat until beef is thoroughly cooked, stirring frequently. Drain. Add rice and vermicelli mix with contents of seasoning packet; cook and stir 2 minutes. Add water; bring to a boil. Reduce heat to low; cover and simmer 15 minutes, stirring occasionally. Stir in bell pepper and sugar snap peas; cover and cook 5 to 10 minutes or until vegetables are tender, stirring occasionally. You’ll find the rice and vermicelli mix where the rice mixes are located in the grocery store. 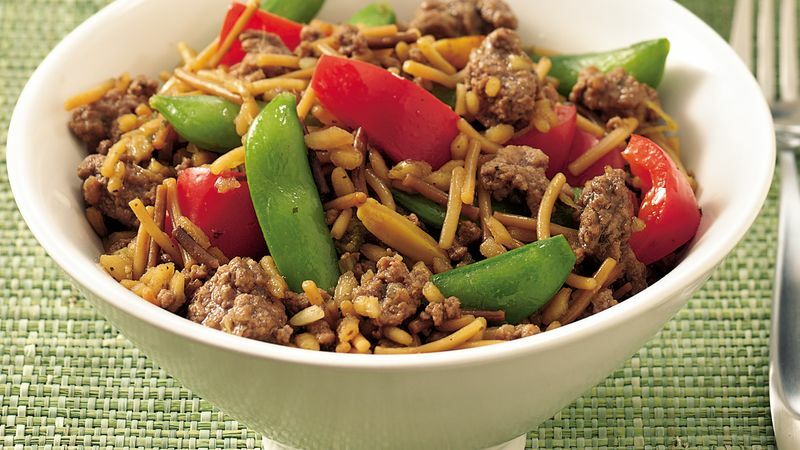 The fried rice variety contains almonds, which add flavor and crunch to this dish. Use 1/4 teaspoon ground ginger instead of the fresh gingerroot. Fresh sugar snap peas can be used instead of the frozen. Pick up some frozen egg rolls to heat and serve with this dish.